This is a fill with a high alarm model. The fill switch can be wired to a valve connected to city water. 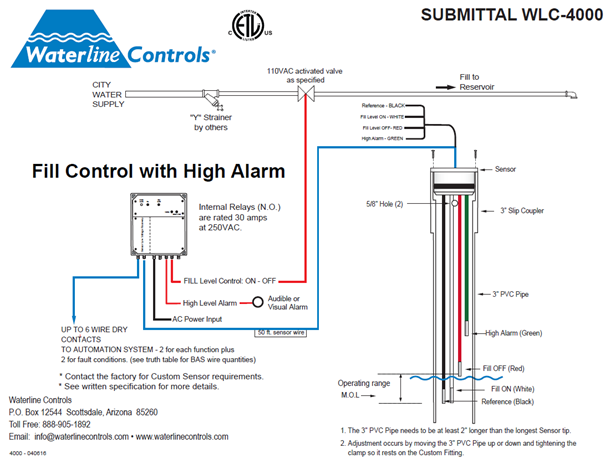 The High alarm can either be wired into a second valve that opens to drain water from the basin that manages to waste, or it can be set to a visual or audible alarm, and finally it could be wired in series with the fill relay to a second relay that is Normally Closed so it opens the contacts to remove power and turn off the valve. This two relay switch is a way to set up redundant switching for overflow protection caused by an electrical or mechanical malfunction of the first relay. The Fill dry contacts can be used as a comparative to develop a baseline benchmark of water usage for the system. *Custom Sensors lengths available upon request. If you are a Reseller, Sales Organization, Distributor, Contractor or an OEM we want to talk with you to determine an SPA price program for your organization so please call us at 1(888) 905-1892 or contact us now. 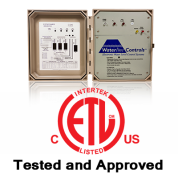 Copyright © 2019 Waterline Controls. All Rights Reserved.